Stevie Lamblin performs with the Dayton Contemporary Dance Company while pursuing master’s degree in clinical mental health at Wright State. Her eyes light up when she talks about it. The 25-year-old Lamblin has been chasing that experience since she was 3 years old. She is also chasing a master’s degree in clinical mental health at Wright State. “The idea right now is that I will continue to do both until they somehow merge,” she said. Lamblin, who grew up in Dayton, describes herself as a high-energy, high-octane child. Her mother wanted to support her in whatever extracurricular activities she was interested in, so she enrolled her daughter in dance classes. Lamblin’s exuberance would sometimes get her in hot water with her instructors, but she danced through the early turbulence. She was told she could possibly make professional dance her career, but she would have to work hard to do it. Lamblin wanted to be the first person in her family to attend college, but as the time approached things weren’t looking good. Lamblin landed a STEM-related scholarship, but couldn’t use it to study dance. Stevie Lamblin joined DCDC2 and then was hired as a full-time dancer with the Dayton Contemporary Dance Company. So Lamblin joined DCDC2, the repertory training ensemble of the Dayton Contemporary Dance Company. It is a resource for new dancers for DCDC’s main company and maintains an impressive record of successfully transitioning dancers into other professional companies, Broadway, film, and graduate schools. After graduating from high school in 2012, Lamblin earned her associate degree at community college and then transferred to Wright State to study psychology. All the while she continued to dance for DCDC2. In 2015, she was required to take an evening class at Wright State that conflicted with her rigorous dance schedule. So she decided to audition for the internationally acclaimed DCDC, the oldest modern dance company in Ohio and one of the largest companies of its kind between Chicago and New York City. 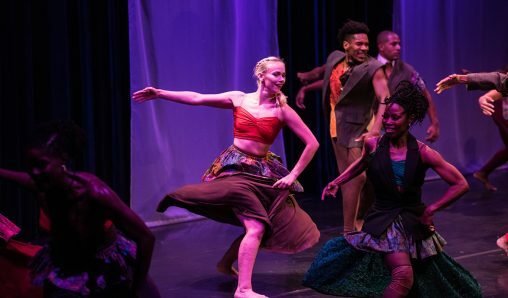 Rooted in the African American experience, the culturally diverse company has toured the world, dancing onstage for packed houses in Bermuda, Canada, Chile, China, France, and Russia. Lamblin’s audition got her an apprenticeship with DCDC, and in 2016, she was hired as a full-time dancer. That same year, she earned her bachelor’s degree in psychology with a concentration in behavioral neuroscience and is now pursuing her master’s degree in clinical mental health. Lamblin has a passion for psychology. Lamblin said Wright State has made it easy for her to participate in classes, despite her demanding work schedule, which includes going overseas for dance performances. “They understand we’re adults. They treat us like we’re competent human beings who should be able to decide for ourselves what we prioritize in our life,” she said. Lamblin wants to be a professional dancer for as long as she can.